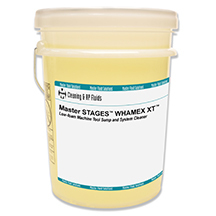 Master STAGES™ Whamex XT™ is a low foam, safe, fast-acting, concentrated formula that will save machine cleaning downtime while removing the oily residues, scums, and insoluble soap deposits that reduce coolant life. Whamex XT is made for cleaning out machine tool sumps and larger systems, coolant supply lines, and coolant recycling equipment. Whamex XT is compatible with most waste treatment (including ultrafiltration) and will not degrade TRIM® metalworking fluids when used as directed.